Gothenburg, Sweden – With poise and grace, the U.S. dressage combinations trotted down centerline on Friday ready to represent American dressage. Their hard work and dedication paid off, resulting in all three combinations placing in the top eight in the FEI Dressage World Cup™ Final Grand Prix. Laura Graves and Verdades led the way for the U.S., placing second on 80.109% closely behind Germany’s Isabel Werth. Kasey Perry-Glass (Wellington, Fla.) was first in the order for the U.S., riding Goerklintgaards Dublet, Diane Perry’s 16-year-old Danish Warmblood gelding. Giving the Swedish audience their first look at the U.S. dressage combinations at this FEI Dressage World Cup Final, Perry-Glass put in a nearly flawless test. With beautiful canter work, the combination finished in fourth place on a score of 77.267%. In her FEI Dressage World Cup Final debut, Adrienne Lyle (Wellington, Fla.) expertly guided Betsy Juliano LLC’s Salvino in his very first indoor test. The 12-year-old Hanoverian stallion proved his spot among the final contenders, earning a 75.326% and the eighth-place tie with the Netherland’s Hans Peter Minderhoud. 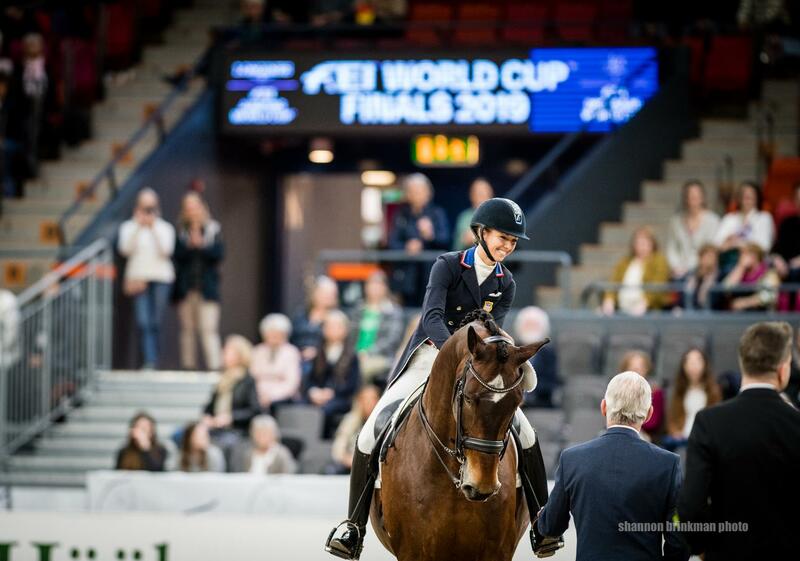 Competition concludes on Saturday, April 6, with the FEI Dressage World Cup Final Freestyle to name the 2019 FEI Dressage World Cup Final champion. Watch it live on FEI TV beginning at 10:00 a.m. ET.